On February 25, tribals from the Gujjar minority community were thrashed by a group of right-wing activists in Samba district in Jammu. According to reports, two local tribals: Mushtaq Ahmad Chowdary and Mohammad Ashraf Chowdary were on the way to their destination when an RSS mob caught hold of them in Vijaypur area of Samba and forced them to chant “nationalist slogans”. 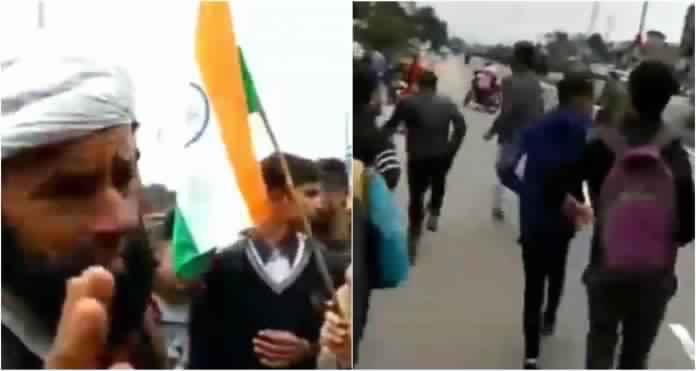 A video of the two being thrashed and being forced to chant slogans in favor of “Bharat Mata” and against Pakistan went viral on social media with netizens demanding authorities to take strict action against the culprits. He said ever since the Pulwama attack the Muslims in the area are being provoked deliberately by the Hindu-right wing parties. When TwoCircles.net raised the issue with Dr. Koshal Sharma, Senior Superintendent of Police, Samba said the police have taken cognizance of the video and have started an investigation. “We are verifying the video…strict action will be taken against the culprits after the investigation,” he added.